Easter Sunday is a big deal in Bolivia. Los Tajibos put out a huge almuerza spread. Many people were there to celebrate the resurrection of Christ. The weekend right after I arrived in Santa Cruz, Bolivia, is something of a blur. Between recovering from an all-night flight from Miami to Santa Cruz, adjusting to a totally different, foreign environment, and readying myself for my talk the coming morning, I was a bit blitzed. 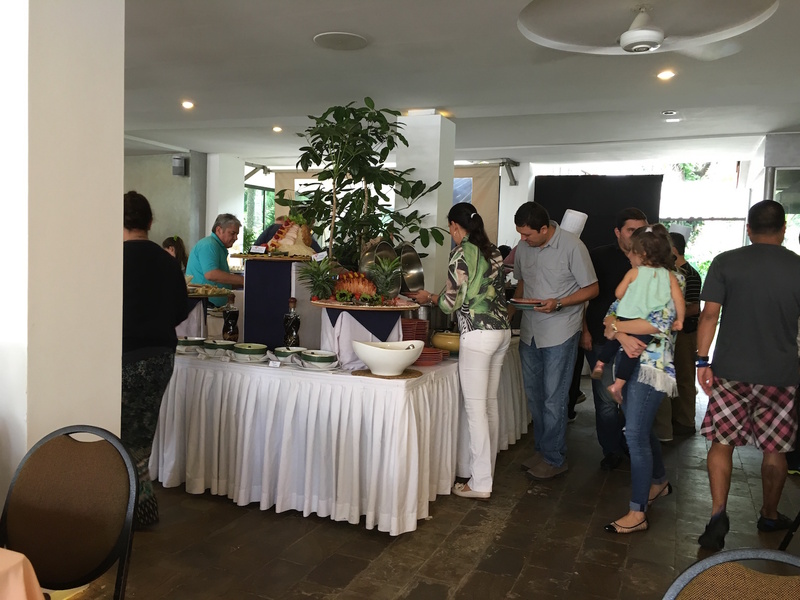 But, I recall going to brunch (really lunch) at the big spread put out by the Los Tajibos resort. There were many interesting things to eat, all prepared according to local custom. I was careful of anything not cooked, because I did not want to be sick and knew I was not accustomed to the local bacteria. I really wanted ensalada, but refrained. I found plenty of food to fill me, though, and enjoyed both the meal and the company. Papá took good care of us.